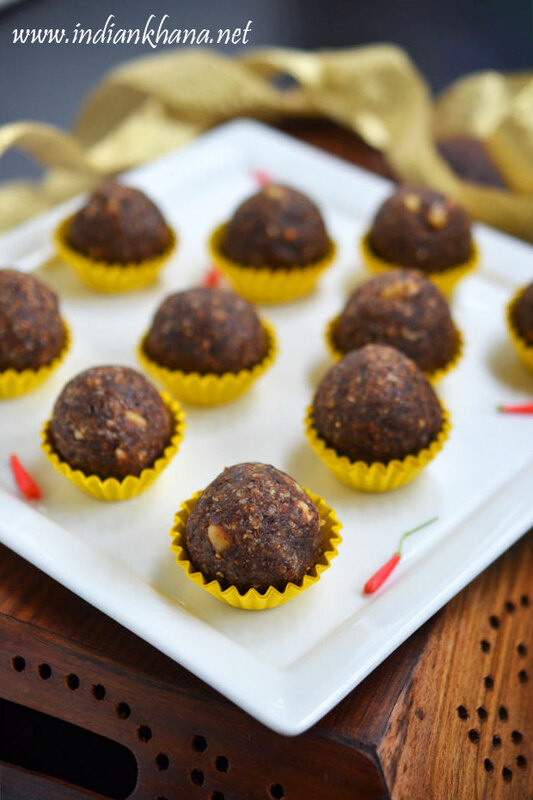 what better diwali sweet than this healthy ladoo specially for diabetic people and the weight watcher requested some healthy recipes so I hope you like this new recipe which not only has nuts, dates, figs but also oats, flax seeds and sesame seeds. Sesame seed has high content of calcium do you know that? 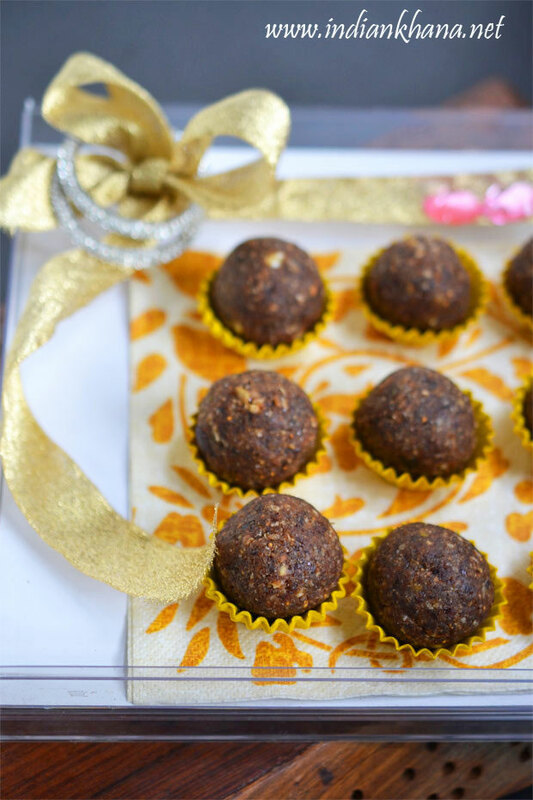 And flax seeds is very low in Cholesterol and Sodium and good source of Magnesium, Phosphorus and Copper but then don't add too much of both to make it super healthy it will result in only bitter ladoos, stay with what I mentioned for this two ingredients for this quantity. 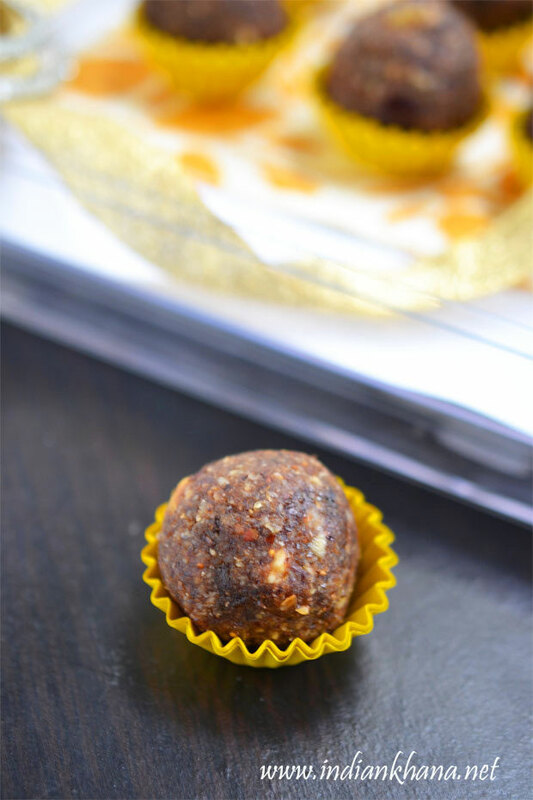 I love dry fruits ladoo always as we can have to every time without thinking of the sugar and ghee ;) these kind of ladoos works great for sugar craving so if you have sweet tooth and still want to control you sugar then always make this kind of healthy dry fruits ladoo and store, it also has long shelf life so you make once and keep for almost 3 weeks to a month happily. 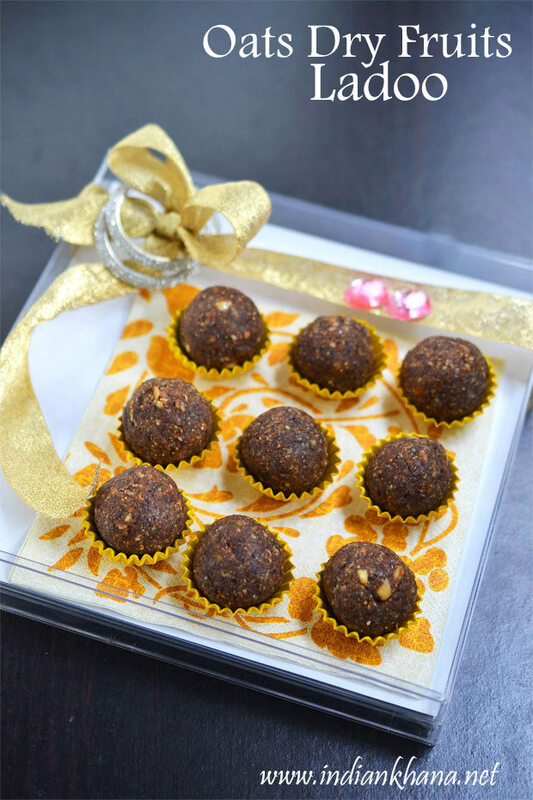 Not only for you but also for kids, specially for kids lunch box, tiffin box you can add this ladoo so they get all the nutritions in form of these cute ladoo, great bargain right? Here am presenting this in cute gift box to give you guys ideas how you can play with your gift box decoration with simple things. 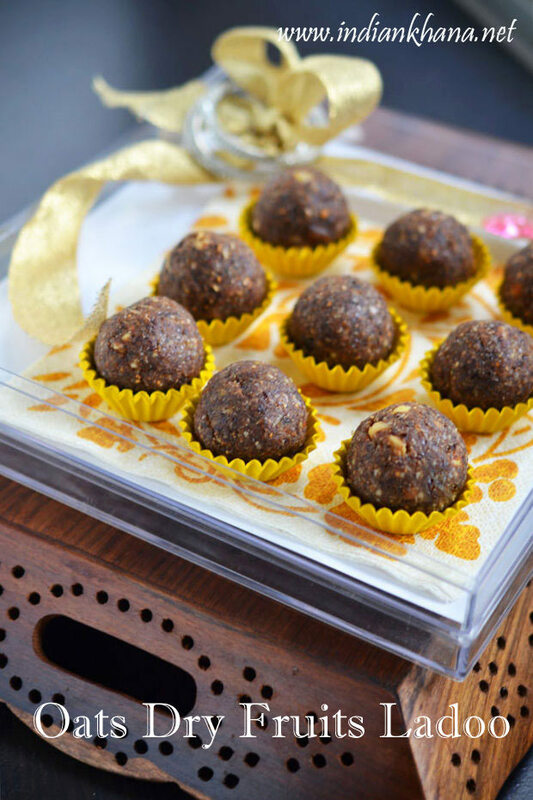 Check out other easy ladoo recipes here. You can gift this to your family, friends and with some little fancy decoration on box to make it looks very festive. 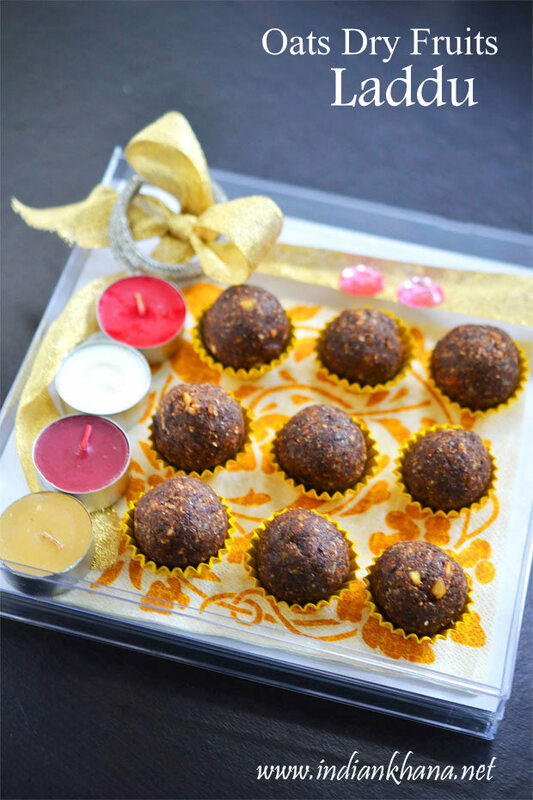 Try this easy sweet for diwali and share you feedback..
Vegan, gluten-free, sugar-free, fat-free ladoo with oats, dry fruits for diwali. Make sure all the ingredients are at romm temperature. Remove seeds from dates chop it, chop figs. Roast flax seeds until they starts to poping up, keep aside to cool. In the same pan add oats and roast 1-2 minutes, roast slightly for a minute in cashnewnuts, almonds, pista, walnut. Grind flax seeds, grind oats to powder, finely chop all the nuts, dates, figs or grind slightly coarsely almonds, cashewnut, walnut, pista, figs, dates, sesame seeds. Don't make everything fine powder other than oats, keep the nuts slight coarse to have good crunch. In a pan or wok add all the oats powder, nuts powder, dates, figs and mix well everything, cook for 3-4 mins in slow flame. Mixture starts to come together, add cardamom powder mix well and off flame and allow to cool. Once it becomes warm enough to touch mix with hand to form a dough if the mixture not binding well you can add few drops of water or add 1 tsp ghee. Divide the mixture into 10 or 12 pieces and roll in balls or laddu. You have to make sure all the ingredients are at room temperature specially dates and figs so they get grind easily and binds easily. You can add any nuts of your choice likes raisins, pecan. Flax seeds adds crunch to laddoo plus it's also healthy. To increase the sweetness you can add more dates, figs or even add sugar or jaggery. This recipe can be ingredients can be adjusted to suit our needs. You can increase or decrease any ingredient. You can also add 1/4 cup desiccated coconut and/or finally roll the laddu in coconut. 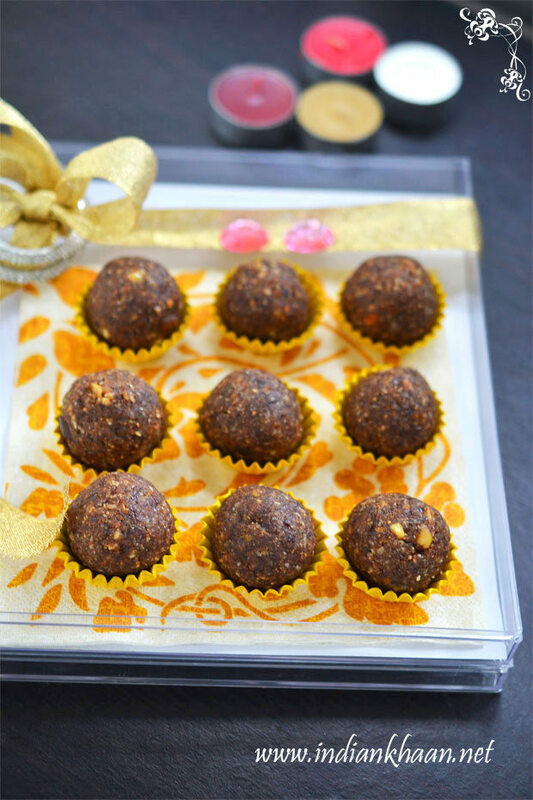 Easy, healthy and yum oats dry fruits ladoo.